From the squares of Spain to indigenous land in Canada, protest camps are a tactic used around the world. Since 2011 they have gained prominence in recent waves of contentious politics, deployed by movements with wide-ranging demands for social change. 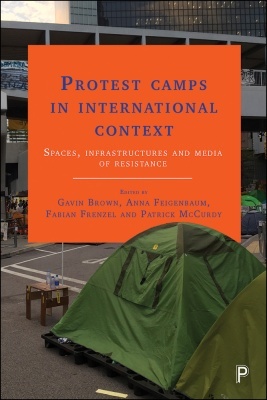 Through a series of international and interdisciplinary case studies from five continents, this topical collection is the first to focus on protest camps as unique organisational forms that transcend particular social movements’ contexts. Whether erected in a park in Istanbul or a street in Mexico City, the significance of political encampments rests in their position as distinctive spaces where people come together to imagine alternative worlds and articulate contentious politics, often in confrontation with the state. Written by a wide range of experts in the field the book offers a critical understanding of current protest events and will help better understanding of new global forms of democracy in action. Future tents: Protest camps and social movement organisation ~ Fabian Frenzel, Gavin Brown, Anna Feigenbaum and Patrick McCurdy.